Hi everyone! This week just seemed to fly by for me. My family and I are looking forward to a nice relaxing weekend and maybe a little stamping time for myself too. I used an image from FireCracker Designs by Pamela to create my card. This is one of my favorite digi images from FireCracker Designs because it is super quick and easy to color and I can just picture how pretty those flowers would be in all sorts of different colors. I printed out the digi image and then I heat set it using my heat gun, that's important and you'll want to remember to do this step. It really does make a big difference and I never have a problem with my digi images smearing. Next, I colored the image using my SU markers- I used Apricot Appeal for the flower centers and Certainly Celery for the leafy swirls. My image was cut using my Coluzzle and Coluzzle oval template and I used corner rounder punch to create my black scalloped layer. If you would like to see my tutorial on how I use my corner round punch to create my scalloped ovals you will find it here. 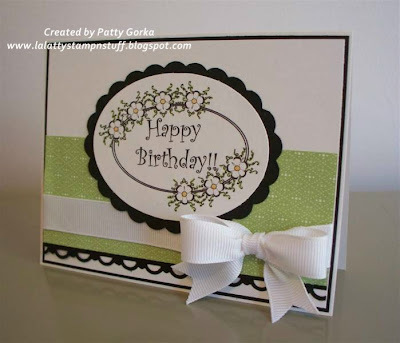 I am also entering my card for week's Stamp Something weekly blog challenge. This week's challenge is to use any digi image or sentiment and create a project with it. Beautiful card Patty. I still haven't mastered the ovel like yours but am working on it. so beautiful love everything about it.